Background With the advent of opioid receptors, a variety of opioid agents are added to local anesthetic mixtures used in peripheral blocks to improve the quality and duration of block. In this study, we compared the effect of butorphanol and tramadol as adjuvant agents for orthopedic upper extremity surgery. Patients and methods This study was carried out on 50 patients aged between 18 and 60 years, of American Society of Anesthesiologists grades I and II, of either sexes in each group, undergoing orthopedic upper limb surgeries through axillary brachial plexus block. An injection of butorphanol 2 mg (group B) and that of tramadol 100 mg (group T) were added to local anesthetic mixture. Onset of sensory and motor blockade, extent of blockade, and occurrence of any complications were studied in both groups. All patients were observed for analgesia postoperatively by visual analog scale pain score. Results In our study, the onset time (minutes) of sensory and motor blockade was delayed in group B (8.76±1.0 and 5.86±0.71, respectively) as compared with group T (7.54±0.88 and 4.6±0.73, respectively). In group B, the duration of sensory block (291.24±48.51 min) was longer than group T (160.42±12.66 min). Duration of analgesia postoperatively (first rescue analgesic) was 619.96±26.96 min in group B, whereas it was 290.2±20.38 min in group T.
Conclusion Butorphanol is more potent and produces longer duration of postoperative analgesia than tramadol, with an extra advantage of sedation and calmness. The axillary block is particularly useful in providing anesthesia and postoperative analgesia for surgery to the elbow, forearm, wrist, and hand. It is also the safest of the four main approaches to the brachial plexus, as it does not risk paresis of the phrenic nerve or has the potential to cause pneumothorax . For axillary brachial plexus blockade, different additives like tramadol ,, dexamethasone , and clonidine , have been added to local anesthetics. Butorphanol has been used alone and in combination with a local anesthetic, like mepivacaine, for axillary brachial plexus blockade. Butorphanol is a synthetically derived opioid agonist–antagonist analgesic of the phenanthrene series. It is seven times more potent than morphine . It exhibits partial agonist and antagonist activity at the μ-opoid receptor and agonist activity at the kappa receptor. Stimulation of these receptors on central nervous system neurons causes an intracellular inhibition of adenyl cyclase, closing of influx membrane calcium channels, and opening of membrane potassium channels. This leads to hyperpolarization of the cell membrane potential and suppression of action potential transmission of ascending pain pathways ,. Tramadol is a synthetic analgesic drug that is antagonized by α2-adrenoceptor antagonists as well as opioid antagonists . The purpose of this study was to evaluate the effect of butorphanol versus tramadol as an adjuvant to bupivacaine and lignocaine mixture (local anesthetic mixture) for axillary brachial plexus blockade on the onset and duration of blockade, duration of analgesia, and intraoperative and postoperative sedation for orthopedic upper extremity surgery. After obtaining the approval of the Institutional Ethics Committee, written informed consent was obtained from the patients. A total of 50 patients of American Society of Anesthesiologists physical status I–II in the age group 18–60 years posted for upper limb orthopedic surgeries were included for the study during the period of 5 months from December 2015 to April 2016 in LG Hospital, Ahmedabad, Gujarat, India. Sample size was 50 as that is the minimum to yield a clear recognizable factor pattern to provide the statistical analysis . The study design was randomized and double blinded. Patients were randomly allocated into two equal groups of 25 each with the help of a computer-generated table of random numbers, and later on, both the groups were compared with the parameters obtained ([Table 1]). Patients not willing to be part of the study and those having known allergy or addiction to study drugs, bleeding disorder, uncontrolled diabetes mellitus, pregnant woman, or pre-existing peripheral neuropathy were excluded from the study. In the operating theater, standard monitoring including noninvasive blood pressure, pulse oximeter, and ECG were attached to the patient. Baseline systolic blood pressure, diastolic blood pressure, heart rate, and SpO2 were recorded. An 18 G intravenous cannula was secured. Axillary block was given utilizing the paresthesia technique using peripheral nerve stimulator. The drug to be used for the block was supplied by a concerned person and injected by the researcher totally blinded to the medication being used. Sensory and motor blockade was evaluated at 5, 10, 15, 20, and 25 min after drug administration ([Table 2] and [Table 3]). Patients were monitored for hemodynamic variables such as heart rate, blood pressure, and SpO2 every 15 min after the block intraoperatively and every 60 min postoperatively for 9 h. All patients were observed for adverse effects like tachycardia, bradycardia, respiratory depression, hypotension, nausea, vomiting, itching, urinary retention, and complications like intravascular injection, hematoma, and post-block neuropathy in the intraoperative and postoperative periods. Postoperatively, patients were observed for analgesia hourly until the patient demanded analgesia (visual analog scale>4). Duration of analgesia was noted as the time taken until patient demanded analgesia. Visual analog scale was observed hourly for 9 h postoperatively ([Table 4]). It is a 10-cm long slide ruler with ‘no pain’ written at one end and ‘Maximum Pain’ at the other. The patient slides the cursor along the ruler until it reaches the level that represents the intensity of his or her pain. The other side of ruler is graduated over 100 mm and gives the investigator a numerical measure of the pain. Postoperative pain relief was considered from the time of end of surgery to the time when analgesic (diclofenac sodium) 75 mg intravenously was supplemented. Intraoperatively and postoperatively, patients were also observed for sedation as per Ramsay sedation score ([Table 9]) ,,,. At the end of the study, masterchart was prepared in MS Excel, and all data were compiled and analyzed statistically with the excel program with the help of PSM Department of our medical college. Descriptive data were presented as percentage, proportion, mean, and SD, and continuous data were analyzed by paired/unpaired ‘t’ tests (only the ramsay sedation score was analyzed in percentage and rest all the datas were analyzedwith mean SD paired “t” test). χ2-test was used to assess the statistical difference between the two groups. The mean±SD age in butorphanol group was 36.04±7.65 and 36.36±7.93 years in tramadol group, which was not statistically significant between the two groups. 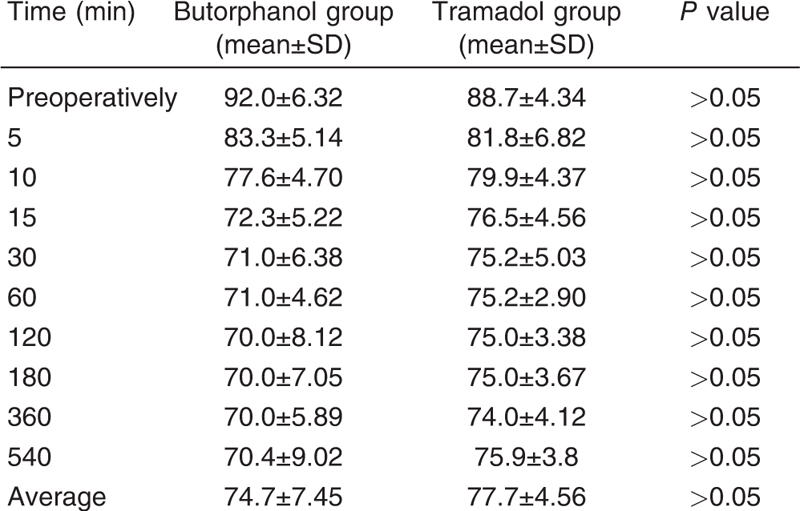 Similarly, mean weight in butorphanol group was 52.40±7.04 and 53.96±8.27 kg in tramadol group, which was comparable in both the groups statistically. 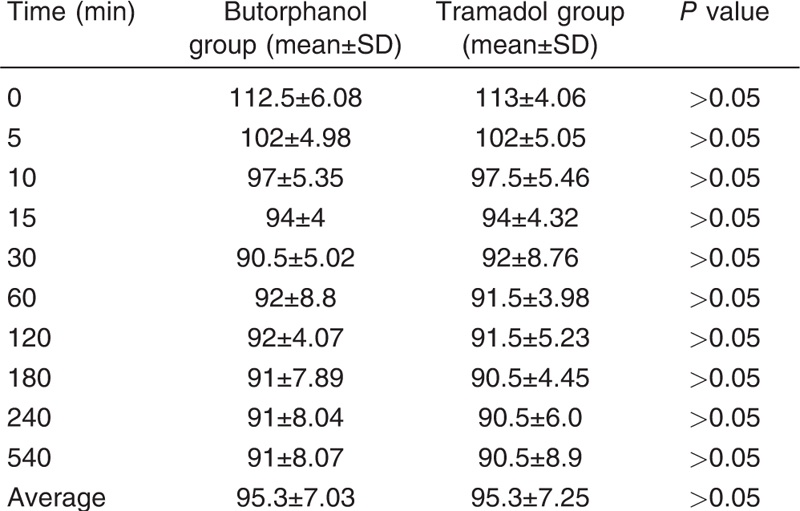 Male to female ratio in butorphanol group was 2.1 : 1 and 1.7 : 1 in tramadol group ([Table 5]). In butorphanol group, the mean pulse rate was 92.0±6.32 per minute in preoperative period, which decreased to 72.3±5.22 per minute at 15 min after the axillary block was given and remained low at 70.4±9.02 at 540 min postoperatively. Similarly. in tramadol group, the mean pulse rate was 88.7±4.34 per minute in preoperative period and decreased to 76.5±4.56 per minute at 15 min after the axillary block was given and remained low at 75.9±3.8 per minute at 540 min postoperatively. Both the groups were comparable statistically ([Table 6]). The mean arterial blood pressure in butorphanol group in preoperative period was 112.5±6.08 mmHg which decreased to 94±4 mmHg at 15 min after the axillary block was given and remained low thereafter till 540 min postoperatively. Similarly, the mean arterial blood pressure in tramadol group was 113±4.06 mmHg preoperatively, which decreased to 94±4.32 mmHg 15 min after the axillary block was given and remained low thereafter till 540 min postoperatively ([Table 7]). Both the groups were statistically comparable (P>0.05). The groups were also statistically similar regarding duration and type of surgery (P>0.05). In group butorphanol, the onset time of sensory block was 8.76±1.0 min and the onset time of motor blockade was 5.86±0.71 min, and in tramadol group, the onset time of sensory block was 7.54±0.88 min and the onset of motor blockade was 4.6±0.73 min. When we compared both the groups, the onset of sensory block was delayed in butorphanol group. It was highly significant (P<0.001). However, when onset of motor block was compared, it was significant statistically. The duration of sensory block was 291.24±48.51 min in butorphanol group, which was significantly statistically longer than tramadol group, 160.42±12.66 min. Duration of analgesia after surgery was completed (when first rescue analgesic given) was 619.96±26.96 min in butorphanol group, whereas it was 290.2±20.38 min in tramadol group T, which was highly significant statistically ([Table 8]). In butorphanol group, 68% of the patients were sleeping but cooperative (score 3), 12% of the patients were awake and cooperative (score 2), and 20% of the patients were deeply sedated but reacted quickly to pain stimuli (score 4) but showed SpO2 98% on air, which actually acted as an advantageous factor when comparing with the tramadol group, where 84% patients were awake and cooperative (score 2), 8% of the patients were awake and calm (score 1), and 8% patients were sleeping but cooperative (score 3). Few patients had to be sedated intraoperatively with injection of midazolam either 1 or 1.5 mg intravenously, and postoperatively also they were found to be apprehensive as depicted in [Table 9]. The mean of sedation scores taken at 0, 1, 3, 6, and 9 h was 3.08±0.57 in Group B and 1.92±0.4 in group T, which was highly significant P value less than 0.001. Only two patients in group B had dizziness and one patient in group T had vomiting which needed no treatment. No other adverse effects were observed in any groups. Pain is an inevitable consequence of surgery. Cutting, tearing, stretching, and burning of tissues during surgery produce intraoperative and postoperative pain. Pain is maximum with orthopedic surgery. If this surgical pain is not treated adequately, it may lead to derangement in various body functions. So treating pain is necessary to reduce the postoperative morbidity and mortality . Peripheral nerve block given with local anesthetic drugs produces analgesia, but to prolong the duration of postoperative analgesia, many agents including a variety of opioids have been used by various investigators. These include morphine, clonidine, pethidine, tramadol, butorphanol, and buprenorphine. Primary afferent tissues (dorsal roots) have been found to contain opioid receptors. Opioids may diffuse from the brachial plexus sheath and then bind with opioid receptor at the dorsal horn. The evidence of axonal flow of various macromolecules suggested possible centripetal axonal transport of opioids into the substantia gelatinosa after perineural injections ,. Brachial plexus block is accepted as a mode of regional analgesia for upper limb surgeries. Axillary block is a simple, easy to administer, and economical technique and the safest of the four main approaches to the brachial plexus, as it does not risk paresis of the phrenic nerve or has the potential to cause pneumothorax. It provides anesthesia for surgeries around elbow, forearm, and hand. With the advent of opioid receptors, a variety of opioid agents are used for postoperative analgesia through brachial plexus block. In this randomized, double-blinded trial, we compared butorphanol and tramadol as an adjuvant to local anesthesia mixture in axillary brachial plexus block and found that butorphanol group had delayed onset of sensory and motor blockade, with significantly longer duration of postoperative analgesia than tramadol group, with an extra advantage of sedation. Kapral et al. added tramadol to mepivacaine to axillary brachial plexus blockade and found that the admixture of 100 mg tramadol with 1% mepivacaine provides a pronounced prolongation of the axillary plexus blockade without adverse effects. Tramadol and its metabolites act by affecting the opiate receptors ,,, and Wajima et al. have studied Injection butorphanol in local anesthetic through continuous brachial plexus block and have demonstrated that butorphanol produces prolonged pain relief in postoperative period, and all the studies are comparable to our study. Our study is also comparable with the studies of Vinod and Talikoti  and Trivedi and Shah  that studied the comparison of buprenorphine 100 µg and butorphanol 1 mg in supraclavicular brachial plexus block and evaluated that butorphanol significantly produces prolonged postoperative pain relief period. Acharya et al. and Mir and Hamid  concluded that addition of butorphanol 2 mg to bupivacaine in supraclavicular brachial plexus block increases the duration of blockade and postoperative analgesia without compromising the hemodynamic parameters of patient significantly correlating with our study. Butorphanol when added as an adjuvant to local anesthetic mixture though has a delayed onset of sensory and motor blockade but significantly prolongs the duration of sensory analgesia and postoperative analgesia than tramadol group, with an extra advantageous feature of sedation, where patients lie sedated and calm intraoperatively and postoperatively. Satapath AR, Coventry DM. Axillary brachial plexus block. Anesthesiol Res Pract 2011; 2011:173796. Kapral S, Goolann G, Walt B, Likar R, Sladen RN, Weinstabi C, Lehofer F. Tramadol added to mepivacaine prolongs the duration of an axillary brachia plexus blockade. Anesth Analg 1999; 88:853–856. Paliwal B, Karnawat R. Comparative study of effect of buprenorphine or clonidine as adjuvants to local anesthetics (bupivacaine 0.25%) for supraclavicular brachial plexus block. IOSR J Dent Med Sci 2013; 4:30–39. Movafegh A, Razazian M, Hajimaohamadi F, Meysamie A. Dexamethasone added to lidocaine prolongs axillary brachial plexus block. Anesth Analg 2006; 102:263–267. Iohom G, Machmachi A, Diarra DP, Khatouf M, Boileau S, Dap F et al. The effects of clonidine added to mepivacaine for paronychia surgery under axillary brachial plexus blockade. Anesth Analg 2005; 100:1179–1183. Mir IH, Hamid A. Addition of butorphanol to lidocaine prolongs duration of the axillary brachial plexus block. Internet J Anaesthesiol 2008; 16:1–5. Wajima Z, Shitara T, Nakajima Y, Kim C, Kobayashi N, Kadotani H et al. Continuous brachial plexus infusion of butorphanol-mepivacaine mixtures for analgesia after upper extremity surgery. Br J Anaesth 1997; 78:83–85. Besson J-M. The place of tramadol in the therapy of pain. Drugs 1997; 53:65–66. Payen JF, Chanques G, Mantz J, Hercule C, Auriant I, Leguillou JL et al. Current practices in sedation and analgesia for mechanically ventilated critically ill patients: a prospective multicenter patient-based study. Anesthesiology 2007; 106:687–695. Vinod CN, Talikoti DG. Comparison of butorphanol and buprenorphine as an adjuvant to local anesthesia in supraclavicular brachial plexus block for post operative analgesia. J Evol Med Dent Sci 2014; 3:4287–4292. Downie WW, Leatham PA, Rhind VM, Wright V, Branco JA, Anderson JA. Studies with pain rating scales. Ann Rheum Dis 1978; 37:378–381. Ramsay MA, Savege TM, Simpson BR, Goodwin R. Controlled sedation with alphaxalone-alphadolone. BMJ 1974; 2:656–659. Sessler CN, Jo Grap M, Ramsay MA. Evaluating and monitoring analgesia and sedation in the intensive care unit. Critical Care 2008; 12(Suppl 3):S2. Liu LL, Gropper MA. Postoperative analgesia and sedation in the adult intensive care unit. A guide to drug selection. Drugs 2003; 63:755–767. Taylor MS. Managing post-operative pain. Hosp Med 2001; 62:560–563. Vitenbek IA, Zhakupov RK, Girshan AI. The perineural administration of opiates during regional conduction block of nerve trunks and plexuses. Anesteziol Reanimatol 1991; 4:56–59. Christoph S, Doz P. Peripheral mechanisms of opioid analgesia. Anesth Analg 1993; 76:182–191. Raffa RB, Friderich E, Reiman W, Shank RP, Codd EE, Vaught JL. Opioid and non opioid components independently contribute to the mechanism of action of tramadol, an atypical opioid analgesic. J Pharmacol Exp Ther 1992; 260:275–285. Hennis HH, Friderich E, Schneider J. Receptor binding, analgesic and antitissue potency of tramadol and other selective opioids. Arzneimittelforschung 1988; 38:877–880. Lintz W, Erlacin S, Francus E, Uragg H. Metabolism of tramadol at Human and animal. Med Res Drud Res 1981; 31:1932–1943. Trivedi V, Shah J. A clinical comparative study of inj. butorphanol v/s buprenorphine in brachial plexus block via supraclavicular approach for post-operative analgesia. Ind J pain 2007; 21:28–34. Acharya R, Jena M, Mishra S, Rath SK. Effect of butorphanol versus placebo as adjuvant to bupivacaine for supraclavicular brachial plexus blockade. Int J App Pharm 2014; 6:8–10.